Yesterday we had a good and funny lunch in Benidorm with my parents and other members of my family. The same day as the Mayor was shot, I had dinner with my parents and I had spoken with my mother about the case. She was not as shocked as me, perhaps because she is older and wiser. She hadn´t even given the thing such an importance. In the middle of the lunch the case came to mind again. "By the way... do you know that the Mayor finally died?" "Yes... and do you know why?" "Nooooooo!. ", corrected my mother, "the suspect French and English couples were not even there when it happened... no.... the Mayor´s wife, 5 years ago, after finding her husband in bed with a man, tried to commit suicide by throwing herself out of the window. She survived, but in a wheelchair, and they divorced. Now they say that it is only a story of jealous gays..."
I couldn´t believe my ears and almost choked on my food! "How do YOU know that? from the TV? Isabel is my mother´s cleaning lady, an enormous 50 year old, local Spanish woman who always knows everything about everything. As soon as I was home I made some research on the Internet and couldn´t find anything concerning Isabel´s theory. It seems that The Guardia Civil still hasnt´a clue what happened. But I wonder: if they had, would they say? 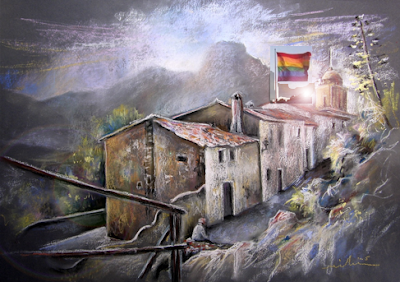 Now I don´t feel comfortable with my exhibition in memory of the Mayor, Not that i despise gays -I don´t care-, but a murder between jealous gays is surely not worth an exhibition of my work! Anyway I don´t take any responsibility for the theory postulated in this entry! A good story in any case. I vote for the maid's version.